The day after the St. Patty's day festivities we slept in a bit - then headed out for brunch/lunch at a restaurant on Magazine St. called Ignatius Eatery. I was excited to try it - mostly because it is named after the main character in the novel "A Confederacy of Dunces". Most people read this book in High School - I read it last year when I borrowed it from Rafe. At brunch I almost never order lunch food - I'm a strictly eggs at brunch kind of gal....but it was already past 1p, and the po'boy's on the menu caught my eye. Mimosa again in hand, I was ready to see what these sandwiches were all about. I ordered the roast beef po-boy and was not disappointed! 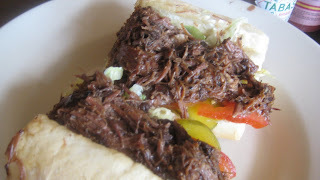 Coming from Boston - where Kelly's Roast Beef is all the rage, I was expecting roast beef cold cuts in my sandwich and was delighted to find POT ROAST in my delicious french bread instead. The bread had a thin layer of mayonnaise, lettuce, tomatoes, pickles and gravy....GRAVY. The meat was tender and flavorful, and very well seasoned. I know what I'll be doing next time I have leftover pot roast! Dave ordered the shrimp po'boy which was deeelicious as well. 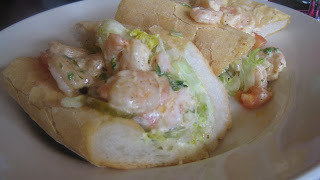 The shrimp were dressed with seasoned mayo in the same french bread with lettuce, tomato and pickles. Dave was again a fabulous share-er of bites. I think I might get thrown out of Boston for my reference to Kelly's and now to the Boston lobster roll, but I think I would take an authentic shrimp po'boy over a lobster roll any day. And just when I thought I had tasted the two best things on the menu, Rafe got the red beans and rice with jambalaya and andouille. 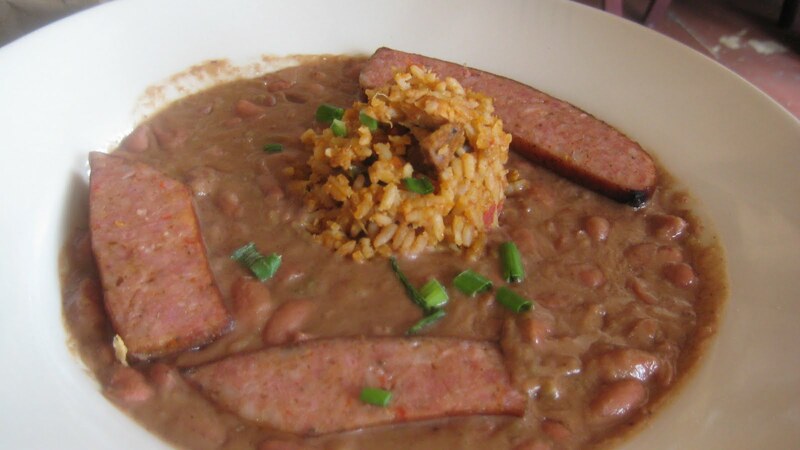 Red beans and rice sounds like such a simple dish - but the flavors were so complex! The beans were creamy and smokey - and oh so comforting with just the right amount of spice. The food at Ignatius was by no means fancy or upscale in any way....but my goodness, did they exceed expectations. I couldn't have been happier with my meal if I had eaten at a 5 star restaurant.